Despite the 48 hours of rain beforehand, the weather was lovely and I think the evening went well, as evidenced by the number of people coming back covered in mud! I’d like to pass on my thanks to Olivia, Bob Daly, Rachel and Pete for doing most of the control collection. And I’d like to say thanks to Eddy for his first event as novice planner/organiser. Very smooth and relaxed on the day and managed to catch a few folk out underestimating the deceptive contours – Mark’s skid marks were particularly impressive. Next up Foggieton – parking will be at or in the streets close to Cults Primary School. Check here Tuesday night for confirmation. CAN’T WAIT FOR THE NEXT EVENT? NEED A FIX NOW? Then try a Permanent Orienteering Course in a local forest or park or try one of our Street O maps for a taste of urban O. 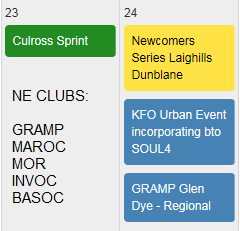 With three months to go until the 2019 Scottish 6 Days Orienteering event, entrants have already signed up from more […] The post Entrants from 26 countries signed up for Scottish 6 Days 2019 appeared first on Scottish Orienteering Association. A well-organised Jan Kjellström International Festival of Orienteering 2019 saw a huge effort put in by many volunteers from across […] The post Scots head south to JK2019 appeared first on Scottish Orienteering Association. This year’s Scottish Schools’ Orienteering Festival is set to take place at Hopetoun House in South Queensferry on Friday 7 […] The post Scottish Schools’ Orienteering Festival 2019 open for entries appeared first on Scottish Orienteering Association.